An essential, and impossible to ignore, examination of one of the most pressing, harmful, and heartbreaking problems facing our country: the widespread poverty among American children. By official count, more than one out of every six American children live beneath the poverty line. But statistics alone tell little of the story. 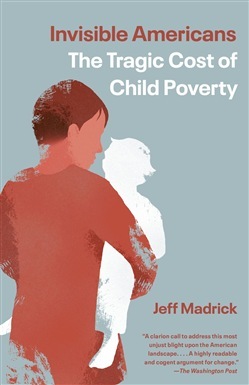 In Invisible Americans, Jeff Madrick brings to light the often invisible reality and irreparable damage of child poverty in America. Keeping his focus on the children, he examines the roots of the problem, including the toothless remnants of our social welfare system, entrenched racism, and a government unmotivated to help the most voiceless citizens. Backed by new and unambiguous research, he makes clear the devastating consequences of growing up poor: living in poverty, even temporarily, is detrimental to cognitive abilities, emotional control, and the overall health of children. The cost to society is incalculable. The inaction of politicians is unacceptable. Still, Madrick argues, there may be more reason to hope now than ever before. Rather than attempting to treat the symptoms of poverty, we might be able to ameliorate its worst effects through a single, simple, and politically feasible policy that he lays out in this impassioned and urgent call to arms. Acquista Invisible Americans in Epub: dopo aver letto l’ebook Invisible Americans di Jeff Madrick ti invitiamo a lasciarci una Recensione qui sotto: sarà utile agli utenti che non abbiano ancora letto questo libro e che vogliano avere delle opinioni altrui. L’opinione su di un libro è molto soggettiva e per questo leggere eventuali recensioni negative non ci dovrà frenare dall’acquisto, anzi dovrà spingerci ad acquistare il libro in fretta per poter dire la nostra ed eventualmente smentire quanto commentato da altri, contribuendo ad arricchire più possibile i commenti e dare sempre più spunti di confronto al pubblico online.